I've decided that from time to time, I am going to have some days that I'll call "Double Header" days. On these days, I'll bust open an extra pack of cards, just for the heck of it - Something fun to do in celebration of the greatest game in America. Today is one of those days. 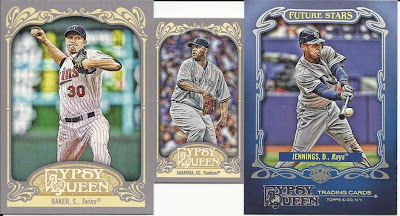 Today's Double Header pack is actually a 3-pack: 2012 Topps Gypsy Queen Wal-Mart edition. I have no idea if there are other varieties, but I bought these at Wal-Mart and in case there are others, I thought it safe (fair, perhaps) to say so. 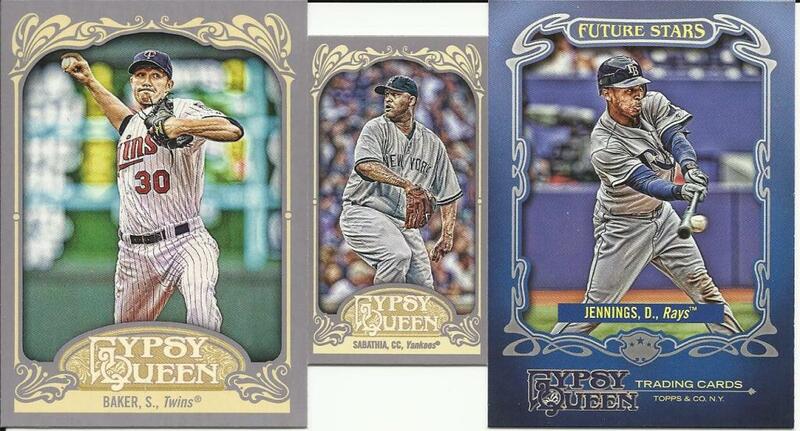 CC Sabathia - Yankees - Mini "Straight Cut"
As a long-time fan and collector, I love this set. It is throwback without being stupid about it. It's got a great mix of past heroes and today's stars, along with a few names I'm not familiar with at all. For me, that's a perfect blend. I'm glad to know these guys will find welcome homes after the season! Heck, the Phils are coming up as short here as they are on the field!!! I do like the GQ cards though they are a bit out of my price point.